Dimensions: Blade Length: 27 15/16", Nakago: 8.35", Mihaba: 1 3/16", Sakihaba: 11/16", Kasane: 1/4", Sori: 9/16"
Mountings: The saya is in excellent condition and beautifully done. 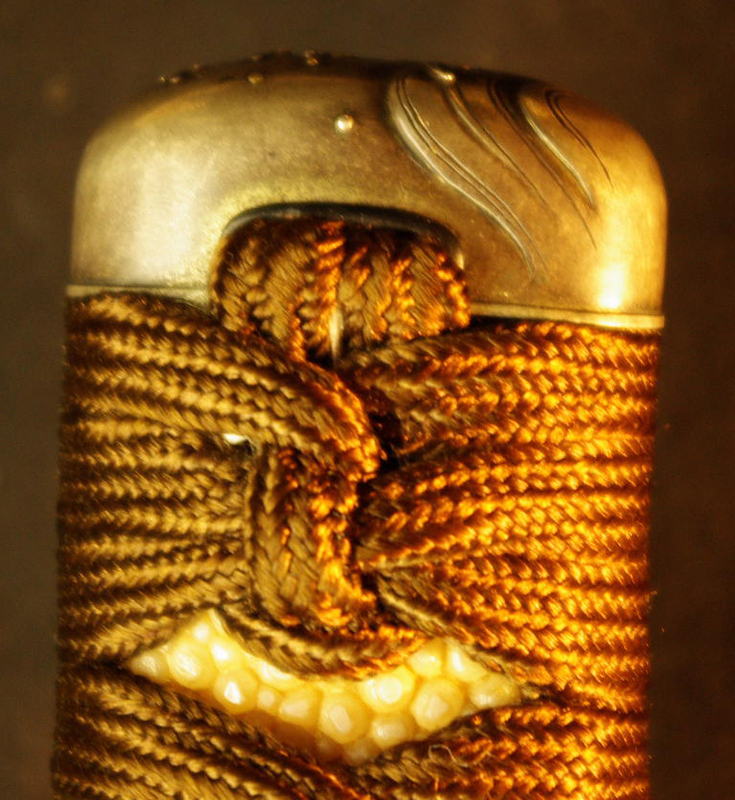 The kodogu is all matching shibuichi of waves in excellent condition with inlaid gold and silver dots. 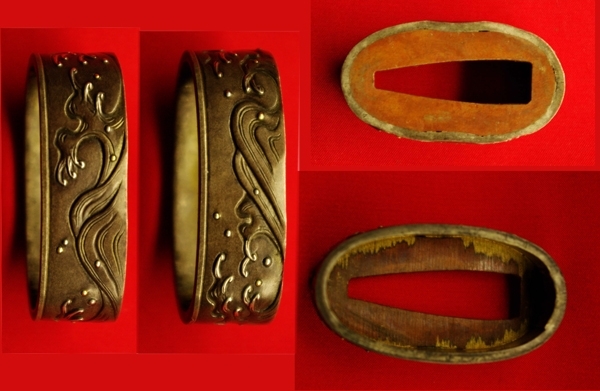 The tsuba is iron in the same pattern as the kodogu and has a nice patina. 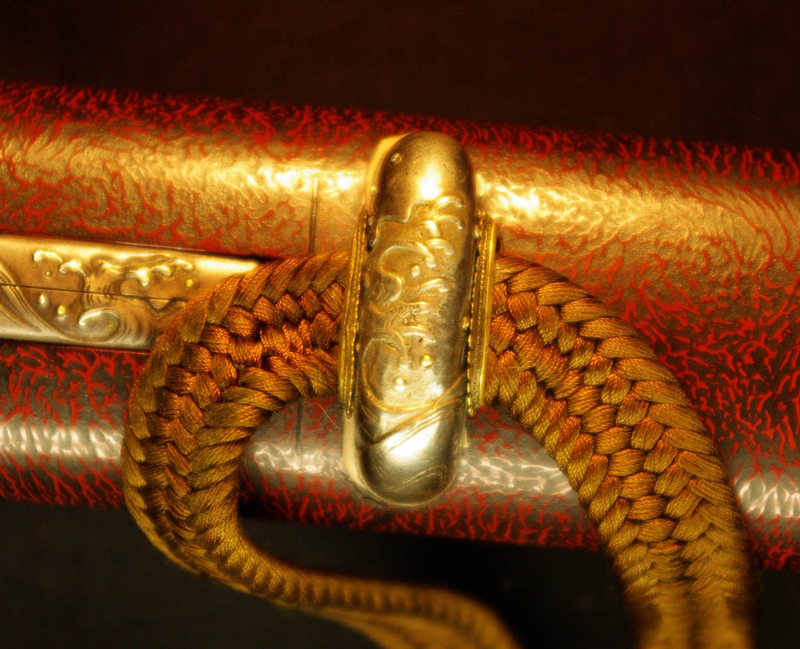 There is a silver fukurin on the tsuba that has several dents from being bumped. The habaki is one piece gold foiled and is solid but there is a tear in the foil on the bottom. Overall Condition: The blade is in very fine condition and the polish, although not fresh, is in fine condition. There is a fourging crack just in front of the machi on the shinnogi-ji and an opening on the same side of the blade just below the mune. The is another forging crack/opening on the opposite side of the blade just above the hamon. Dimensions: Blade Length: 23", Nakago 6 3/8, Mihaba: 1 1/8", Sakihaba: 7/8", Kasane: 7/32", Sori: 3/8"
Mountings: The Sho saya is in identical condition and as beautifull as the Dai. 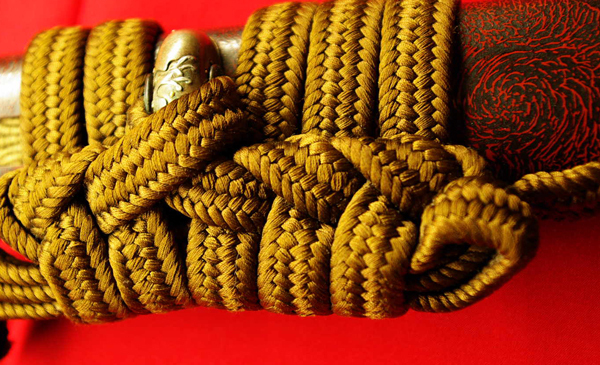 The kodogu is all matching with the Dai and in equally as fine condition. 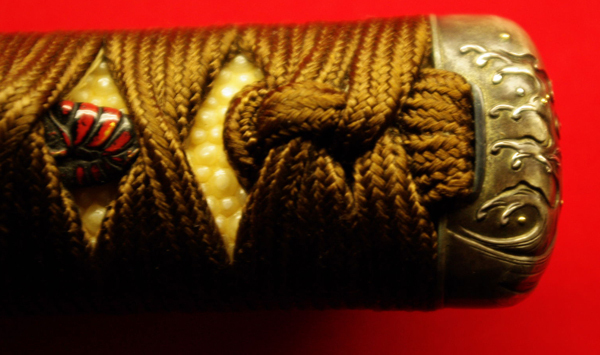 The fukurin on the tsuba also has several dents from being bumped. The habaki is also one piece gold foiled and is in good solid condition. Overall Condition: The blade is in very fine condition and the polish, although not fresh, is in fine condition.